Loading and storing data in any database (SQL, NoSQL) supported by Agile Data (http://agile-data.readthedocs.io/en/develop/persistence.html). Form can be used a web application built entirely in Agile UI or you can extract the component by integrating it into your existing application or framework. The rest of this chapter will focus on Form mechanics, such as submission, integration with front-end, integration with Model, error handling etc. Unless you specify a submission handler, form will save the model User into $db on successful submission. If your form is NOT associated with a model, then Form will automatically create a ProxyModel and associate it with your Form. As you add fields, they will also be added into ProxyModel. If you develop feature like that, please let me know so that I can include it in the documentation and give you credit. First argument to addField is the name of the field. You cannot have multiple fields with the same name. If field exist inside associated model, then model field definition will be used as a base, otherwise you can specify field definition through 3rd argument. I explain that below in more detail. You can specify first argument null in which case decorator will be added without association with field. This will not work with regular fields, but you can add custom decorators such as CAPCHA, which does not really need association with a field. 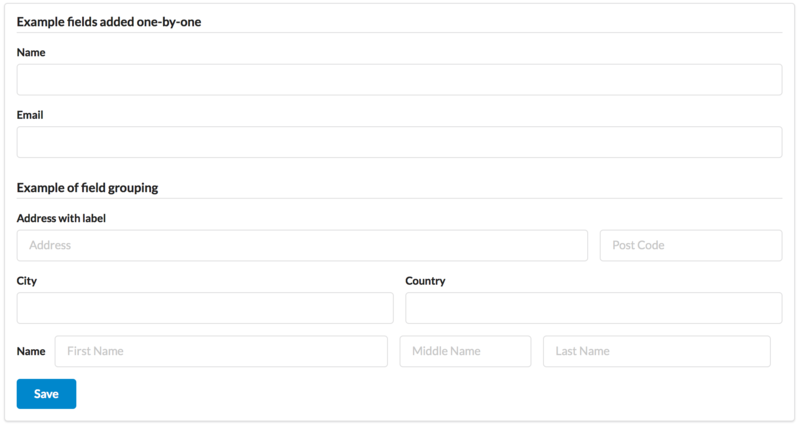 Form uses a small UI components to vizualize HTML input fields associated with the respective Model Field. We call this object “Field Decorator”. All field decorators extend from class FormField::Generic. For more information on default decorators as well as examples on how to create your own see documentation on FormField::Generic. If Decorator is not specified (null) then it’s class will be determined from the type of the Data Field with decoratorFactory method. Data field is the 3rd argument to Form::addField(). If your form is using a model and you add additional field, then it will automatically be marked as “never_persist” (http://agile-data.readthedocs.io/en/develop/fields.html#Field::$never_persist). Field date1 is defined inside a ProxyModel as a date field and will be automatically converted into DateTime object by Persistence typecasting. Field date2 has no type and therefore Persistence typecasting will not modify it’s value and it’s stored inside model as a string. In a large projects, you most likely will not be setting individual fields for each Form, instead you would simply use addModel() to populate all defined fields inside a model. Form does have a pretty good guess about Decorator based on field type, but what if you want to use a custom decorator? This is where $field->ui comes in (http://agile-data.readthedocs.io/en/develop/fields.html#Field::$ui). Without the ‘type’ propoerty, now the calendar selection will be stored as text. Associate field with existing model object and import all editable fields in the order in which they were defined inside model’s init() method. You can specify which fields to import and their order by simply listing field names through second argument. Specifying “false” or empty array as a second argument will import no fields, so you can then use addField to import fields individually. As before, field password will not be loaded from the database, but this time using onlyFields restriction rather then never_persist . TL;DR - sometimes validation needed when storing field value inside model (e.g. setting boolean to “blah”) and sometimes validation should be performed only when storing model data into database. If user specified incorrect value into field, can it be stored inside model and then re-displayed in the field again? If user must enter “date of birth” and he picks date in the future, should we reset field value or simply indicate error? If you have a multi-step form with a complex logic, it may need to run validation before record status changes from “draft” to “submitted”. Form will rely on Agile Data Typecasting (http://agile-data.readthedocs.io/en/develop/typecasting.html) to load values from POST data and store them in model. Form submit handler will rely on Model::save() (http://agile-data.readthedocs.io/en/develop/persistence.html#Model::save) not to throw validation exception. Form submit handler will also interpret use of Form::error by displaying errors that do not originate inside Model save logic. Specify a PHP call-back that will be executed on successful form submission. Create and return jsChain action that will indicate error on a field. Create and return jsChain action, that will replace form with a success message. Name of the template which will be used to render success message. At the time of writing, Agile UI / Agile Data does not come with a validation library, but you can use any 3rd party validation code. If ‘field’ parameter is not set or any other exception is generated, then error will not be associated with a field. Only the main Exception message will be delivered to the user. Core Exceptions may contain some sensitive information in parameters or back-trace, but those will not be included in response for security reasons. When you create a Form object and start adding fields through either addField() or setModel(), they will appear one under each-other. This arrangement of fields as well as display of labels and structure around the fields themselves is not done by a form, but another object - “Form Layout”. This object is responsible for the field flow, presence of labels etc. Sets a custom FormLayout object for a form. If not specified then form will automatically use FormLayoutGeneric. Adds a form header with a text label. Returns View. Creates a sub-layout, returning new instance of a FormLayoutGeneric object. You can also specify a header. Renders HTML outline encasing form fields. Form layout objects are always associated with a Form object. Same as Form::addField() but will place a field inside this specific layout or sub-layout. For further styling see documentation on View.